Had a wonderful mini-storm yesterday, then it all blew over and left us with a brilliant day - sun bouncing and magnifying off the perfect snow and pouring into the windows. We're in the living room, Michael at his computer and me reading over notes for the next book - fire lit (not for the notes - yet) and tea on the mind. Lovely. We're off tonight to see our friend Cotton. She's in her late 70's and quite spectacular. She called the other day to say her two huge grandchildren (one of whom is known as 911 because as a child he always threatened to call it whenever he didn't get his way) were leaving today (Thursday) and she felt the need for all grown up company. Did we want to meet her for dinner at the Italian restaurant in Sutton. Then she called back to say would we like to see a movie in Sutton? Now, Sutton doesn't actually have a movie theatre, so we were wondering if Cotton has begun (perhaps thanks to some magic element brought into the house by the grandsons) not only hearing voices in her head, but seeing pictures too. No, she explained - it's at the Salle Alec Pelletier, an intimate space on Rue Maple where community groups put on productions, and in fact, The Cruellest Month had it's local launch. Every now and then they show a film. Then she called back and asked if she'd remembered to tell us it was a Chinese film. No, but that's OK, we said. Our enthusiasm still strong. Don't know why, but I quite like Chinese films. Even Jackie Chan. But mostly Raise the Red Lantern etc. It has subtitles, Cotton said - which we all agreed was helpful. In French, she muttered, and hung up. French? Now, our French is good - but to have to read it, quickly, for two hours? Then she called again. Don't forget to bring pillows, since the seats are extremely uncomfortable. We're expecting another call any moment reminding us to bring hammers to hit ourselves with. Talk to you tomorrow - flat bum and all. By the time I was across the border (DVD's declared) the heavy rain was turning to sleet, and then snow. I could see on my dashboard the temperature dropping by degrees as I drove north, until finally it was almost white-out. Wasn't worried. I know the road so well and Sutton wasn't far. But still, quite dramatic. Bought food, returned home and made chili con carne. Opened mail, and there was the German publishers spring brochure. Right there, taking up an amazing three full pages, was their spread for A FATAL GRACE/DEAD COLD. Which, of course, now has another name. UND DIE FURCHT GEBIERT DEN ZORN. I don't speak German, but wasn't Zorn a character in an original Star Trek episode? Hope they haven't renamed Gamache 'Zorn'. The only German I speak I learned in school. All I remember is: Iche bin Frau Seichs. Which isn't as useful as you might imagine. But perhaps slightly more useful than the only Russian I can remember: adeen haladeelnik (sp?) which means - one refrigerator. But I must say I'm BEYOND thrilled with the German publishers going all out to promote the second book. Adds in all major newspapers and magazines - they've drawn a map of Three Pines and put together a very moody presentation. Fabulous. The publisher is Limes. Impressive. And more good news about the second book - this time known as A FATAL GRACE. The American audio book has been shortlisted for the prestigious Audie Award, sponsored by the Audio Publishers Association and Audio File Magazine. It's really a great acknowledgement of the skill of the narrator, Ralph Cosham. Congratulations, Ralph. Take care, and I'll try to write soon. Sunny, mild, mini-storm expected around noon! Great news - Maggie is fine. She chipped a bone in her wrist (?). Hard to heal, and she might limp every now and then, but so do Michael and I. We were in Montreal yesterday and Sunday - lots of appointments. All good. Had the best time doing a part of the writing process I enjoy the most. I took my notebook over to a local cafe, ordered a bowl of cafe au lait, sat by the fire in a big leather chair, and outlined book 5. I'd been making notes for months on characters, clues, red herrings, twists. Gathering quotes and ideas - some tiny little grace notes and some huge plot points. But I wanted to write a timeline...that of course goes back way before the book even begins. I love doing that. Just closing my eyes and seeing the action, seeing specific scenes. Seeing problem areas and waiting quietly for inspiration to solve them. There's a Second Cup in London where I love doing this. It's on the King's Road in Chelsea. Michael and I get our coffees and go upstairs and try to get a seat by the large, sash windows overlooking the flower stall opposite. And I scheme. Planning to start book 5 on Friday. Today's busy. Haven't been to the office in a while. Have a book endorsement I need to email, have a conference call with London publicist at 9:30 about the London Book Fair events then another one at 10:30 with the New York publicists about the March 4th launch of The Cruelest Month. Need to do a lot of paperwork too, including responding to emails. The email from the website was down for a few days. We got it fixed but that means all the ones undelivered were suddenly delivered! If you wrote to the website last week and haven't heard back - I'm sorry! I hate knowing there's mail unanswered, especially from people kind enough to write and be supportive. Hate thinking they think I don't care. So today I'll be writing back, though it might take a while. We were concerned when we arrived at the Montreal apartment because the week before there'd been a terrible rotten eggs smell in the building. Really noxious. We told the super about it, then went to our apartment, wading through thicker and thicker stink. Really most unpleasant. We'd determined to get to our apartment, break easy, then call with a firmed complaint. As soon as we opened our apartment it really struck. For some reason the rotten eggs seemed to be coming from US! Our apartment had indigestion. We called down and told the super it might be 'someone on our floor' - then packed up and ran back to Sutton. Somehow it didn't seem all that unexpected that of all the apartments it would be ours that was passing gas. At least it wasn't making noises too. When we arrived back this Sunday all was well - and forgiven apparently since no one said anything to us. Hope you're well and we'll talk soon. Hello? Hello? Hello? Is that Dr Watson? Beautiful day. We're back home which always feels terrific. Had a great time in Toronto, though. Such fun to see the fabulous Arthur Conan Doyle collection at the Toronto Reference Library. A woman named Peggy showed us around. They have, among lots of other things, an illustrated copy of the VERY first Holmes short story ever. Only 26 in the world! As a Holmes nerd this was unbelievable! Actually, I know I can tell you this and it will go no further, I had a crush on Dr. Watson. Am I the only one? Surely not. John Brady, the other mystery writer at the library event, was brilliant. Lots of terrific questions too, like whether we'd started out with the intention of writing a series, or if that just happened. And if it was intentional, what decisions did we make about character, setting, etc, that played into the series idea. LOVE the hotel - the SoHo Met (no, sadly, they don't give me a free room for mentioning them, though actually the publisher McArthur pays anyway). Had a lovely train trip down to TO and a horrible one back. Both on Via First, but on the way back our seats had no window, little leg room and the man behind us talked non-stop, either to the poor woman beside him or into his cell phone. I was plugged into the iPod for most of the trip (Hey there Delilah, what's it like in New York city, dah, dah, dah...) and doing the final fine-tuning on book 4 (sent it to London and NY this afternoon - yay), but Michael reported it was most annoying to listen to this man droning on. I was also guilty of that, spending about 20 minutes on a call to St Martin's Minotaur publisher Andy Martin and my editor there Hope Dellon. We seemed to go through a tunnel everytime Andy spoke, so I spent a lot of time yelling, 'Sorry, pardon, excuse me? What was that?' Not very interesting to the people around me and probably not very amusing for Andy either. Now, remind me again, is it a good idea to annoy the publisher, or not? Fun call though, which I might be able to tell you about one day soon. Which reminds me - we're getting close to the March 4th release of The Cruelest Month in the US. If any of you have contacts with your local media and can get the book reviewed in your paper, that would be wonderful. The big challenge, even for a third book, is spreading the word. And anything you can do to help would be so appreciated. Must be off. Poor Maggie's leg isn't any better. Now I'm getting worried. Michael says I catastrophize things, and he's right. Happily, nothing I've ever been afraid of has actually happened. So that's good news for Maggie. We're taking her in for a scan Monday morning. I'm sure she'll be fine. Be well, and thanks for all your support. Wow, who's the cool chick in the deer stalker? Michael and I are in Toronto now. All showered up and ready for the event tonight at the Toronto Reference Library with fellow crime writer (and McArthur club member) John Brady. Spent all of today doing what I think are the final revisions on book 4. Hope Dellon, my editor at St. Martin's Minotaur in New York got back with her notes. Very few changes, thank God! Still, it took me 6 hours. Granted, a lot of that was re-reading passages and doing my own fine-tuning. Taking out a word here and there. Trying to make it as lean as possible, the meaning as clear as possible. No unnecessary words. My prose will never be skeletal, don't want it to be. But still, each word should have a purpose, if only in setting scene and tone. It's an exciting process - and I know Hope's and Sherise's notes (Sherise Hobbs, my editor at Headline in London) make the books so much stronger. It's quite unusual to have two main editors. Normally one country buys the book first and subsequent countries simply take the already edited manuscript. But NY and London bought the series on exactly the same day. (Thrilling day for me!) So, voila, two editors. I think we were all a little nervous about how it would work, but it's been fabulous. It angers and saddens me when people say women can't work together. That hasn't been my experience at all. Hope and Sherise really try to accommodate each other, and respect each other, and respect me (which is, after all the MOST important thing). I remember listening to the wonderful Jacqueline Winspear on a panel and being asked about her editors and she had the best answer. She said that while she was writing the book belonged to her, and her alone. But once she'd finished and sent it off, it then belonged to the team. Of which she was a member - but only one member. Each member (agent, editor, publisher, publicist) had a right to a say. I loved that. I love collaberation. Perhaps because I can blame others, always handy. But I find it makes for a much stronger book. Not a committee - but thoughtful people working to make sure the story is clear and clearly told. Thrilling. Heard from Teresa (my agent) today that Estonia has bought the series. Very exciting. And the event Tuesday night in Montreal was simply (and unexpectedly) fantastic! Snowing like all get-out - tons of the stuff. All day. And blowing. Very difficult driving. Michael and I wondered the best way to even get to the event, which was downtown at the McGill University Bookstore. Parking is terrible at the best of times and this was pretty close to the worst of times. In fact, a lot of people thought the event would be cancelled. But they don't know me and a potential audience! We took the bus. Budgeted an hour and a half to get there, and got there in 20 minutes. always the way. Lots of people too. Really great atmosphere. Kim Stephenson, who helped organize the event, was fantastic. But you know what really blew me away? The organization of the McGill Alumni. they sent announcements to 65-thousand grads, around the world. Now, the furtherest anyone came was from the West Island (about 10 miles) - and, of course, Estonia. (kidding). I was so grateful to the 60 or so people who did come. It really was a dreadful night. And people did come from a distance. But I think that added to the atmosphere. We felt like the courageous, or insane, few. If you were one of the ones there on Tuesday at McGill - thank you! Still no title for book 4. The trouble is we have a couple of great titles and we're just trying them out. We're close. Will tell you when one rises to the top. Must run. Am sitting in a bathrobe in front of a picture window almost flashing downtown Toronto. Sauve qui peut. Taryn, from McArthur, is picking Michael and me up at ten to six. The good librarians at the Toronto Reference Library have arranged a private tour of their quite extensive Arthur Conan Doyle collection tonight before the event! I was such a Holmes buff growing up. Spent first year university in a deer stalker. Can't tell me that's not cool. So this should be fun. Back to Montreal on the train tomorrow. Nice to know book 4 is finished. (Though I've thought that before). Had breakfast with Joan this morning. She's remarkable. 76, runs the meditation and yoga centre in the village (Mother from DEAD COLD/A FATAL GRACE) was inspired by her, though Joan is a tiny woman. Her daughter, Wendy Matthews, is a huge (as in popular) singer in Australia and her son Gary has been kidnapped by us and forced to renovate every inch of our home. We adore him and really aren't looking forward to seeing him leave. Still, we know one day he'll tunnel out and that'll be it. Back to Wendy in Australia for a moment. Joan showed me a remarkable photo of Wendy from a Sydney paper. Wendy's just released another album and so is doing a lot of press. This one shows her at home with one of her pets - a deer she rescued and named John Deer. Any Canadian will recognize the reference to the famous equipment manufacturer. Wendy was walking in the woods one day and saw a doe give birth (a very rare sight anywhere but apparently almost unheard of in Australia where deer are quite rare, I'm told). The mother died as Wendy watched. She then moved quietly in and picked up the little one, and took him home. And called Joan in Canada asking what to do! Joan, of course, had as much idea as you or I would. But through more common sense than I have, and love and luck, John Deer lived. And grew. When he was a year old Wendy decided to let him go wild, but he found his way back! And now he lives outside her home, and often comes in for a visit, wandering into the living room or kitchen. The photo in the paper shows Wendy kneeling and John nuzzling her hat. Can you imagine the patience she must have had? The work she must have put in? The courage to let him go though she loved him? Joan Matthews raises amazing kids. And what luck for me to have her as a friend. I don't go to her yoga classes and she doesn't read my books, but we know each other and support each other in places only good friends can. BTW, no sign of the little deer next door. The apples are still there, so I suspect he's found a family. I choose to believe that. We're in Montreal now. Appointments on Monday, event Tuesday. It's sponsored by McGill Reads and is at the McGill University Bookstore, on McTavish, at 5:30. Hope to see you there! Bring a deer. Or a dear. My dear will be there. I call him Michael. Speak soon - be well. We're heading for a high tomororw (sunday) of minus 20! Yikes. But for today it's a beautiful, snowy day. Saw on TV the ads for Maureen Jennings wonderful TV series, the Murdoch Mysteries! How thrilling. And they look great. High production values, which is key. Always afraid the producewrs will go cheap and screw it up, but it looks as though they've done Maureen proud. According to the ads, the series debuts this coming Thursday on CITY TV in Canada. For those of you unfamiliar with Maureen's works, she writes the Murdoch series, set in Toronto in the late 1800's. She's marvelous, really bringing the city alive - you can almost smell turn of the century Toronto. And they're mysteries (obviously) so there's the added joy of a great yarn too. I'll actually be in Toronto this coming Thursday, but will be doing a talk and reading at the Toronto Reference Library with John Brady, another mystery writer. It starts at 7pm, and if you live in the city it would be great to see you there. But we need to rush back to the hotel, to watch Maureen's show! Will try not to blab on - though I can't garantee anything from Mr. Brady, who is just about the most entertaining speaker (and terrific writer) I know. As you might have noticed, I only talk about writers whose works I admire. If I don't like their work I simply won't mention them. There are enough critics out there. Besides, I know how much it stings and I have no desire to do that to another writer. Having breakfast tomorrow with Joan - always a delight. have realized I much prefer breakfasts or lunches, to dinners. Quite dislike going out for dinner now. Especially in winter. But give me a good breakfast out with friends and I'm all over it. Though I must be off now - into the dark, snowy night. Having a small celebration with friends tonight. Saturday night. The Edgar nominations have just been announced and St Martin's Minotaur did extremely well! John Hart and Ken Bruen are both shortlisted for Best Novel, and Derek Nikitas is nominated in Best First Novel for Pyres. But, not to be too parochial, it's an amazing achievement for anyone to be nominated, regardless of imprint. So, congratulations to all the nominees! Had marvelous news from a woman who is a great supporter of the Three Pines series and has become a sort of 'pen' pal. Anny Robinson wrote a couple of days ago to announce the birth of her great grandson! His name is Leonidas Rex, after a Greek hero. But he'll be known as Leo. Or, as Anny pointed out, Lion King. Imagine having a great grandchild. And - it's a day for interesting news and information - had a message from a member of the Moravian Church after I wrote about the world's oldest bookstore in yesterday's blog. Al Reynolds wrote to give us the good news that they are alive and well and indeed have a fascinating history. Here (with his permission) is part of his message to me. I found it extremely interesting, and humbling. The well of information I don't know just gets deeper! Hi, Louise -- You noted the Moravian Book Shop and wondered about the Moravian Church. We are one of the two still-surviving "Pre-Reformation Protestant" communities. We trace our heritage to John Hus, several generations prior to Luther and Calvin and the other well known Reformers. We are not an ethnic group, just a "different flavor" of the entire worldwide Christian community, with a different heritage and history but the same substance -- we are fully involved with our neighbors. If you attended a Moravian worship service, it would feel a lot like a Lutheran event except for a different musical heritage and minor peripheral variations. Our forebears, after their stressful 1547 decision to become a community separated from the Roman Catholic Church, corresponded with both Luther and Calvin in hopes that the groups could grow together. But everyone was stubborn about "Our own way" and nothing worked. Now, in the 21st century, we have a Full Communion Agreement with the Evangelical Lutheran Church in America that allows us to call a Lutheran pastor to one of our pulpits and allows the Lutherans to call a Moravian pastor to one of theirs. The Executive Directors of the Minnesota Council of Churches and Pennsylvania Council of Churches are Moravians, as is the editor of the standard reference Handbook of Denominations in the United States, so we "play well with others." That was sent from Al Reynolds, and I really, really appreciate the information. Makes me want to visit the Moravian Bookstore even more. Which reminds me, I must run - Mary Pat Beebe, from the store in Bethlehem, is calling any minute now. Be well and we'll talk tomorrow. Now I'm off to sit with a hot chocolate by the fire and talk with the good people at the bookstore. Rotten life. Had to take Maggie, our 9 year old Golden Retriever, to the vet this morning. She developed a limp over New Years. We thought maybe Buttercup (the hound from Hell) had tried to eat her. After a day or so it got better, but she still seemed sore. You know dogs, their pain tolerance is almost limitless. But she just didn't seem herself. So off to Dr. Mascale this morning. He found a bump (or bimp, if it was Inspector Clouseau's dog) on her left rear leg. Phew. I was worried it was her hips, which can be a misery for Golden's. So now she's on anti-inflammatory and pain pills. With luck she'll get better fast and I can have a few. Got back the UK editors notes on revisions to Book 4 (still no title). So far so good. She's very pleased. Now just a little polish here and there. But still waiting for the US notes. I tell you, it never ends. Even when a book is in print I still get proofs from the publishers, for the paperback edition, or a re-issue or something. There have been so many surprises about the publishing industry. One is, how hard the editors work. I always kind of suspected, but they're incredible. Received a very kind invitation today from a fellow Canadian mystery writer. Robin Harlick lives in the Ottawa area and writes the terrific Meg Harris series, also set in Quebec. So we're sort of sisters, and really enjoy seeing each other, mostly at conferences. She wrote to ask me to headline the Crime Writers of Canada National Crime Writing Week, in Ottawa. The event will be May 29th. We'll just be heading off to Bristol, UK for CrimeFest, but Michael and I really like Robin and adore the CWC and will do just about anything to raise the profile and credibility of Canadian crime writers, so this was a great fit. Just wrote back to say yes, please. And I'll be doing a conference call with the world's oldest bookstore tomorrow! It's the Moravian Bookstore, in Bethlehem, Pennsylvania. They're reading STILL LIFE and their meeting is tomorrow at 10:30. Looking forward to it. Mary Pat Beebe, who runs their book club meetings, sounds like a dynamo. Actually, I'd love to visit it - can you imagine just being in the store? Mary Pat says it's the world's oldest continuously operating bookstore, founded by the Moravian Church in the 1750's. Incredible. I've never heard of the Moravian Church. I wonder it it's as long lived as the bookstore? I have a new favorite song. Play it over and over, like a moron. Humming it now. It's 'Hey There Delilah' by the Plain White T's. It's a simple, lovely song. Just a guy and his acoustic guitar singing a love song. Beautiful. Shall I sing it for you? Michael and I once took singing lessons, but the teacher quit. Really. It was beyond embarrassing. When people tell you anyone can sing, don't believe them. We now have a nice layer of snow over the grass after last week's annual January thaw, so this is a picture-perfect Canadian winter day. Crystalline and fresh. We drove in to Montreal for a check-up on Michael's eyes (everything great) then scooted out again as fast as we could. Had to stop to buy bananas, not for ourselves but for our Golden's Maggie and Trudy. If any of you read STILL LIFE you might remember the scene where Peter is feeding Jane's grieving Golden bananas. roses and lived in the kitchen. Our dogs, especially Bonnie who died two years ago, inspired that passage. They go NUTS for bananas. And when we run out there's a real crisis of faith in this home. We're suddenly gods with feet of clay and empty hands. We slice up cheese, which the dogs accept, but with some disillusionment. So Michael's eyes and bananas became the priority today. Happily it all worked out. Felt like something out of The Three Stooges. Nyah, nyah, nyah. Great news yesterday. Germany bought The Cruellest Month and book 4 and are launching the second book Dead Cold (A Fatal Grace) this spring. They've apparently done a pop-up version of Three Pines to go along with the books. Quite looking forward to seeing it. And a California production company queried about film rights for The Cruelest Month. They sound like a terrific company, so it's fun, but I don't get as excited as I once did. I heard an author describe a film query this way: Optioning your book is to a finished film what a first date is to a wedding day. Clearly, one doesn't happen without the other, but the chances of a happy ending are thin. We've recently turned down a TV series because we (Agent Teresa Chris and the people who handle the TV/Film rights in London) felt it was too soon, and the production company understandably wanted the rights to the characters, and I wasn't ready to hand those over. It is exciting, but it also helps that I firmly believe if a film or TV series is meant to be made, the right offer and the right company will come along. Best to wait than accept something that isn't wonderful. Until then, well, Michael's eyes are perfect and the house is filled with bananas. Our life is already divine. Be well, and we'll talk soon. More wonderful news today - The Cruelest Month received a STARRED REVIEW in Library Journal! That's three out of four starred reviews, and I'm gobsmacked. Been waiting a long while to use that word, and this seems the perfect time! So that means starred reviews for The Cruelest Month from Kirkus, Publishers Weekly and Library Journal. As well, we've added a speech to the Rotary Club in Detroit on March 12, as part of the US tour. I love speaking to service clubs. They're very enthusiastic and supportive people. Even if they don't buy the books, they're extremely kind, and that goes a long way in my book. Received Louise Ure's latest book, THE FAULT TREE, through the mail today. I'd read it in proof and blurbed it with great enthusiasm. She's created the most extraordinary heroine - she's a blind car mechanic. At first I thought it was a joke, or a terrible error on Louise's part - but a paragraph in and I was hooked - and the book just got better and better and has a nail-biting finale. Magnificent. Highly recommend it. Went to Richford, Vermont today - supposedly for gas (much cheaper than in Canada) but two bags of jelly beans followed me home. These trips across the border are fraught with danger for me. If it isn't a smuggling transgression it's a dietary one. Still - I expect on my death bed one of my few regrets will be not eating more desserts. So I'm putting that to rights right now. haven't actually eaten them yet, but I don't think they'll see the sunrise. Michael and I had lunch at a local tea room in Sutton. Tintoretto. wonderful, eclectic menu. I had a curried meatball soup (not kidding) and a Greek salad. Michael had the same soup and a Reuben sandwich. We had bowls of cafe au lait for dessert and shared a homemade key lime cheese cake. That deathbed regret is rapidly receding. A good days work. heard a fantastic show on CBC radio - never heard it before but I think it's on every Monday morning between 11 and noon, nationally. It's called Whitecoat Black magic. It's hosted by a doctor and it appears to be about the medical profession. Fascinating. Hope you're well and I'll speak to you tomorrow I hope. India Today? Now, are you just making this up? Perfect day - we're still in Montreal, but heading back to the country tomorrow. Michael's eye still fine. Busy week last week. Went to Toronto and did an event at Casa Loma with Giles Blunt (terrific writer) - it was sponsored by the Crime Writers of Canada. Lots of people, lots of fun - fantastic location for a murdery mystrery evening. Cheryl Friedman from CWC is a really amazing woman. A dynamo who also manages to be very kind. Stayed at a great hotel - the SoHo met. New for me. The manager turns out to be the brother of a former colleague and the best friend of another former colleage at the CBC - Lorne Saxberg, from Thunder Bay, Lorne and I co-hosted the CBC Radio morning show show shen he was 21 and I was 20. But we sounded about 55 (as everyone does on CBC). People were shocked when we'd show up for public events - not believing Lorne's booming, masterful voice belong to this little blonde kid. Tragically Lorne died two years go while scuba diving. It felt great to talk about him with someone who knew him so well. Then back on the train - VIA One - no one around. Spent most of the 5 hour journey editing book 4, listening to my iPod and looking out the window. Arrived back in Montreal to find the CWC had sent the box of books to be judged in the Arthur Ellis Best First Novel category. There are 15 - but in a cruel optical illusion it looks like 130 books. And - great news!!! - returned to the news that THE CRUELEST MONTH in the US has been given a starred review by Publishers Weekly! That's two starred reviews - one from Kirkus and the other from PW. As well, India Today has made the UK version - THE CRUELLEST MONTH - one of it's book club selections! And in Canada THE CRUELLEST MONTH has landed on the bestsellers lists today for the third week in a row. This is a lot more fun than a kick in the head (of which I've had a few - particularly painful when I do it to myself). Just finished the notes on book 4 - will send back to the publisher tomorrow. Michael healthy, THE CRUELEST MONTH flourishing, book 4 done (again). Life is great. Hope your life is great too - full of health and peace. And joy. Talk soon. Michael's eye operation went brilliantly! In the Mtl General at 6:30 this morning - operated by 8am, home by 10:30. He had a lens implant in his bad eye, but it's almost exactly the same procedure as a cataract - only backward really. Instead of removing something, the doc put something in. Michael was very brave but admitted afterwards he barely slept the night before and was very tense. I can imagine! I got him carrot cake from the Bistro on Greene Ave and a cappuccino, he had a nap and now he's a lot better. He's wearing what looks like an athletic support on his face - confirming what most women already suspect about men and their brains. Not many men, actually, could carry off this look, but he looks quite dashing. He also looks, slightly as though she's turning into Jeff Goldbloom from The Fly. But don't tell him that. And we both want to thank Linda L. Richards for her wonderful, and fun, blog that sustained the site this week. And congratulate her again on the US publication of DEATH WAS THE OTHER WOMAN. Well done, you. We're staying in Montreal until Monday. Storm coming in tonight (snow and freezing rain) and doc Cohen wants to see The Big Guy tomorrow morning at 6:30 (again!!! what is it with these eye doctors - can't they tell time???) then again on Monday - probably at midnight. Still, we adore Montreal. Even with an eye patch (or cup) on one eye it's a fantastic city. Am making (read 'ordering') dinner now. Michael gets to choose his special sick boy meal. Chicken wings and pizza - and Live Free or Die Hard on the DVD. Take care, and I hope to blog tomorrow with other news. Hope you're well. Grace and Wit and Charm - that's Linda L. Richards! Today I've asked a great friend and brilliant novelist, Linda L. Richards, to write the blog. In fact, because I'm off to an event at Casa Loma in Toronto next week and Michael's having a small operation on his eye after that, I'll be keeping her blog up for about a week - to keep you company. As you'll see when you read it, she's remarkable company. The other reason for this - and the timing - is because her new book DEATH WAS THE OTHER WOMAN is being launched this week by St Martin's Minotaur! We have the same publisher in the States and I've had the amazing pleasure and privilege to read this book. It's fantastic! It'll blow your socks off (and I know some of you have as many socks as I do!) It's noir, and funny, atmospheric and deeply moving. It's a murder mystery you won't soon forget and I urge you to get a copy of DEAD WAS THE OTHER WOMAN as soon as possible. Overcast. 8 degrees C. Light rain. To be very honest, it intimidates me to be here. I’ll tell you why. 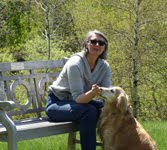 Whenever I have written about or discussed Louise Penny, whatever I’ve said has been peppered with words like “grace,” and “wit,” and “charm.” Because she is those things. More. If you’ve spent time with her – in person or by reading her books or hanging out here on her blog – you know this to be true. 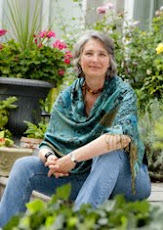 I can think of few people as filled with grace as Louise Penny, so imbued with natural charm. And it is by the goodness of that grace, that charm, that I visit with you now. I’m sorry. I embarrass her. I can see her over in the corner, hiding a delicate blush. It can’t be helped. I’m sorry my dear: I only calls them as I sees them. You knew that when you asked me here. It was the risk you took. In terms of our careers as novelists – our new careers as novelists – Louise and I go way back. My first novel, Mad Money, came out in December of 2004. It was nominated for the Arthur Ellis Award for Best First Novel and, perhaps because of this, I was asked to moderate the first novel panel at the Bloody Words conference in 2005. Louise’s first novel, Still Life, would not be published until that fall and so no one – aside, I guess, from her agent and her editor and her husband -- could predict the instant stardom that would come her way. Yet there was something about her – I called it grace. And wit. And charm – that was just impossible to miss. We had a nice connection from the first, Louise and I. And threads of similar backgrounds. We’re both Canadian. Both journalists-now-novelists. Both passionate about wonderful food. Both in love with and loved by talented men named for saints. Other things, probably, but you get the idea. And, as fate would have things, that connection has been deepened by our evolving careers. So here I sit just a couple of days ahead of the official publication date of my fourth novel, Death Was the Other Woman, a book that -- not so coincidentally – Louise read almost before anyone else. Not long after the book was accepted for publication, I asked her to read the manuscript with an eye to giving me a pre-publication blurb for the book. She graciously did this, taking time from her own writing schedule to immerse herself in early 1930s Los Angeles. There have been other reviews since, of course. Other blurbs, as well. But can any words mean as much as those of your peers? I think not. Especially those among your peers you consider not only talented, but also to embody grace and wit and charm. You see, there’s a certain bistro? In a lovely B&B? I’d like you to show me the way. We’ll share a sandwich, you and I. Something on a baguette with two kinds of cheese. We’ll eat it by the fire, with perhaps a bowl of soup each – lobster bisque? -- and a cup of tea. All things that warm. And we’ll talk about mysteries – about loving them, and reading them and, yes, even making them – and then, afterwards? We’ll take a walk in the snow, through the center of town and right past the three pines. And we’ll remember that visit. Always. PS FROM LOUISE: As you see, Linda and I are great friends. An unexpected gift that came out of the writing. Who wouldn't love this woman. And I swear, you'll love her book too. DEATH WAS THE OTHER WOMAN. And I hear, joy of joys, that she's deep in to the sequel. Yippee. Croissants and pastry and cheese, oh my. Before I say anything else I want to thank all of you who wrote concerning my last blog. Such kindness and support. So unexpected - and welcome. As I said to some of you, I was unsure of the wisdom of opening up that much, but in a kind of plunge decided to do it. And I'm genuinely grateful to you for making me feel good about it. Well, it's Saturday around noon. Mike and Dom arrived yesterday and are staying at the guest cottage - which is great anyway but especially great given that Gary (who we're convinced now lives in the basement and sometimes makes rude sawing noises down there) is still working on our renovations. He made our cedar closet yesterday, and as he left he said it reminded him of cleaning out the pee-soaked shavings from his hampster cage as a kid. Men. Always know the right thing to say. Though he also called first thing this morning to say he was reading the Saturday Montreal Gazette and there was The Cruellest Month on the bestsellers list again! Gary redeemed himself - and then some. Yippeee! Dom and Mike are walking over for lunch (a quiche made by Dom - thankfully, for all of us) then Michael and I are taking then around the area. To Kirk's antiques store in Knowlton, and the fabulous La Rumeur Affamee, the bakery right on main street that has long wooden counters, and glass display cases and barrels of fresh baked croissants. The walls are stacked with all sorts of baguette. And across the aisle are cheeses, many made locally, some by the Benedictine monks at the nearby abbey, and some imported from France. It's a dietary disaster. Perfect for Mike and Dom. Then we'll take them up to Mont Sutton, so they can see where it is for next time, when they bring their skis. Must be off - they'll arrive in a moment. Hope you're enjoying these young days of the new year. And, thank you again. For everything. It's January 2nd - for me a far more significant day than the 1st. This is my sobriety date. Today I'm celebrating 14 years without a drink! Not with a glass of champagne. Don't normally talk about this - figure it's private. But recently some people in interviews have asked about a line in the acknowlegments for STILL LIFE, my first book. In it I talk about having gone through a time in my life when I thought I'd die from loneliness. When I wrote that I knew it was possible someone would ask about that time - and I knew if asked, I'd answer honestly. And so I've recently talked about being an alcoholic. And what finally brought me to my knees - to the end of what I could stand - wasn't the booze, it wasn't embarrassment or shame or losing a job or a home. It was loneliness. I couldn't live with that ache, that howl, that hole another day. 14 years ago I knew the best had been and it was downhill. And now? I have everything I could have dreamed of, and more. I came close to ending it all - I know how that feels. And I know how it feels to realize my life isn't ending, it's just beginning. People sometimes laugh at the amount of gratitude I have - I think they suspect it's a bit much. A bit over-the-top. But the only difference between me and someone who didn't make it - from what I can see - is luck. How could I not be grateful? I'm not the brightest bulb in the box, I'm not the prettiest, the most deserving, the hardest working. I'm just damned fortunate. Anyway - I wanted to share this with you. It's the most important part of my life - even more important than Michael, and he knows it. Because without sobriety there'd be no marriage, no Michael, no home, no friends, no books. No nuttin'. Every Saturday I go to a 12 step meeting. I make coffee and set up the chairs and tables, and talk with people as they arrive. And I know I belong. How lucky is that? This is a great day. Be well, be happy - and we'll talk tomorrow. Happy New Year! 2008 - can you believe it? Part of me is still waiting for the millennium. I remember as a child being doubtful I'd live to see it - since by my reckoning I'd be pretty decrepit. Since the storm was coming - and the 3 kids were creating their own emotional micro-climate - Doug and Mary decided to leave yesterday afternoon. They called last night - safe and sound in Toronto. Always a relief to get the call. I was in bed watching the fireplace log. It was quite difficult to get to the computer since the kids were busy downloading various viruses, biological war blueprints and bomb plans. And worst of all, music videos. We're on dial-up, which I'm not sure the kids have ever heard of. It was as though we were speaking a different language. 'Because we're on dial-up', he's say, slower, as though he himself was suddenly on dial-up. Whatever shred of cool we'd earned by having a flatscreen in the bedroom was squandered on the dial-up. We slid back into the idiot Aunt and Uncle category. Buttercup (the Hound from Hell) was doing her part for the family holiday. Three hours in to the visit and she'd eaten a baguette, a loaf of pumpernickel and a very dense loaf of organic multi-grain bread. Normally Buttercup (the Hound from Hell) also eats the packaging, so it's difficult until a few hours later, to know exactly what's happened - but this time she left most of the plastic. For the rest of the visit she also left 'you-know-what' all over the house. Though, to be fair, she did fine-tune it, until finally her 'packages' we restricted to the dining room and my study. I was relieved to realize the thing stinking up my study wasn't my fourth book at all, just Buttercup (the Hound from Hell). But what a stink! You remember Phil Spector and his Wall of Sound? Well Buttercup Penny has achieve her Wall of Smell. It was almost visible. The apples next door are gone - eaten by either BC (Buttercup or Brain Cell as she's also known in the family for the one she seems to fire up every now and then) or the deer. Haven't seen the little deer lately, so she's either found a 'family' to join, or Buttercup has eaten her. Happily for the deer BC is afraid of everything except carbohydrates. So now we're back to peace and quiet and the home smells of wet dogs, coffee and woodsmoke. We miss the family. Even BC. Have a wonderful New Year. I'm off now to sit in front of the fireplace and start on the editors notes on Book 4. Always a bit stressful until I get underway. I must say, I'm enjoying this book. Should have the final edit done by the end of January, then will start on Book 5. Might even come up with better titles.